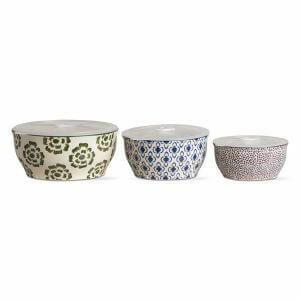 A mix and match design the Bali Lidded Ceramic Bowl Set brings you an ideal gift set for Fall. These bowls make food storage a cinch and fit inside one another. Also make fantastic mixing bowls with a Set of 3. Each bowl has its own bohemian design in bali hand painted style and comes with it’s own perfect sized plastic lid. Colored in hues of Olive, Sky Blue, and Bark Brown. Dishwasher Safe. The Bali Lidded Ceramic Bowl Set complements most any dishware set, and makes a fantastic storage solution. Hand-painted and Hand-stamped these bowls feature a bali design with a glazed finish in multiple styles, colors, and sizes. In addition, each bowl also has its own clear plastic locking lid. There are 3 different sizes included in this set: large 32.5 ounces, medium 20 ounces, small 12 ounces. Large size is an Olive floral stamped design, medium is a Sky Blue diamond design, and the small is a bark brown mixture of mini-gray spots. 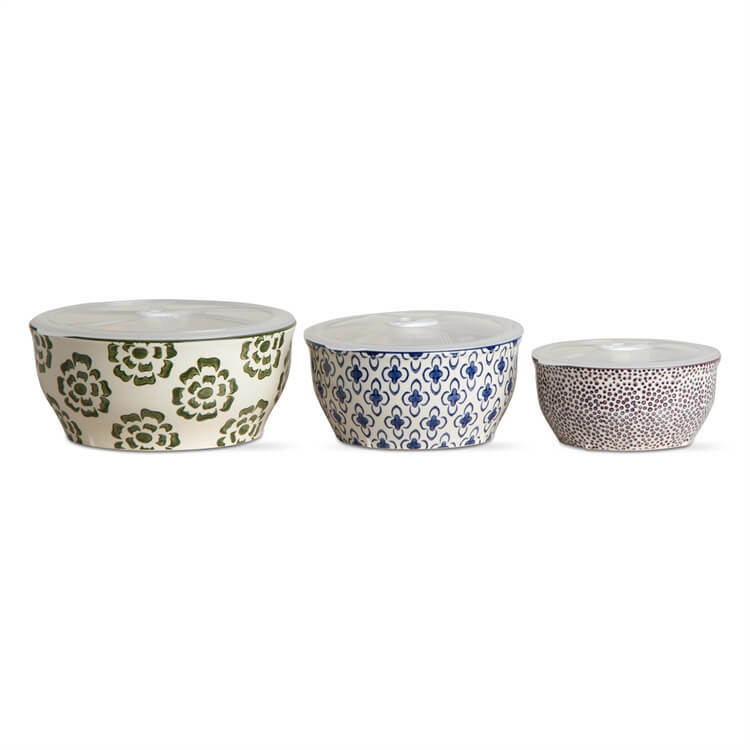 Mix and store something yummy with our Bali Lidded Ceramic Bowl Set. Care: Dishwasher Safe; Do Not Microwave.